Anti-GFP assayed by ELISA for direct binding of antigen recognizes wild type, recombinant and enhanced forms of GFP. Fusion protein corresponding to Aequorea victoria GFP aa 1-246. 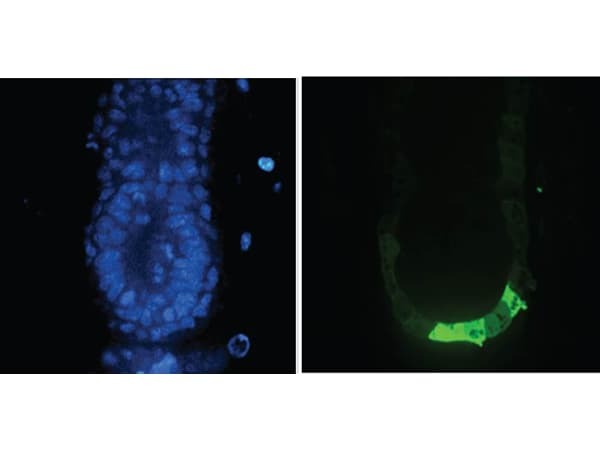 IHC: E5.5 Hex-GFP transgenic mouse embryo. WB: HeLa cells. Green Fluorescent protein. Our Abpromise guarantee covers the use of ab6673 in the following tested applications. (for immunoprecipitated GFP, see Abreview). 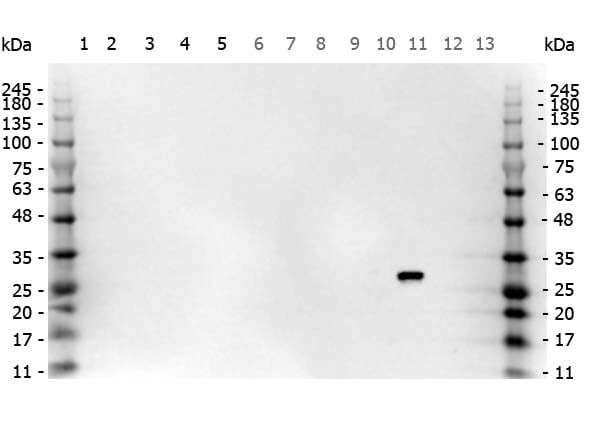 This antibody can be used to detect GFP by ELISA (sandwich or capture) for the direct binding of antigen and recognizes wild type, recombinant and enhanced forms of GFP. Immunohistochemistry - Free Floating - Anti-GFP antibody (ab6673)Suarez-Bregua et al PLoS One. 2017 Oct 17;12(10):e0186444. doi: 10.1371/journal.pone.0186444. eCollection 2017. Fig 1. Pth4:eGFP transgenic zebrafish embryos at 1 and 2 dpf were fixed with 4% PFA and washed in PBST. They were then washed in PBDT (1% BSA, 1% DMSO, 0.1% Triton X-100 in PBS, pH 7.4), blocked in 10% normal goat serum/PBDT, and incubated overnight at 4°C with primary antibodies to HuC/D (1/100) and GFP (1/400, Abcam ab6673). Further PBST washes and blocking were followed by secondary antibodies overnight at 4°C. Hoechst 34580 was added to stain nuclei (1/2500). 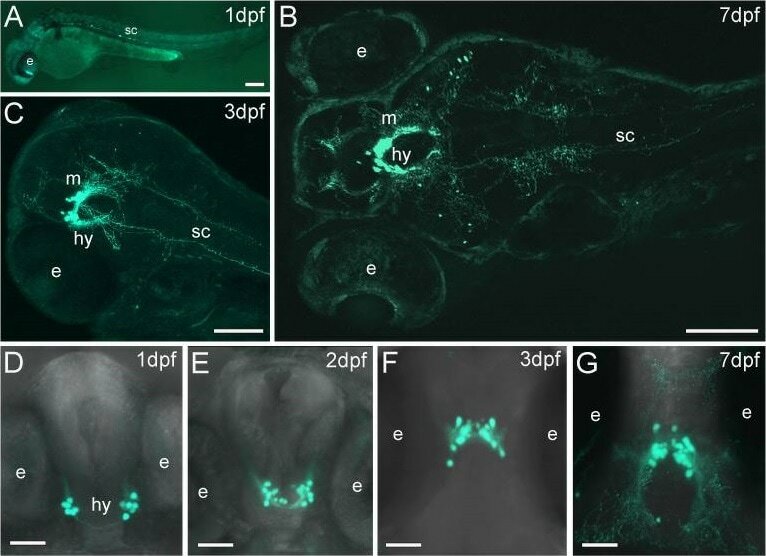 After further PBDT and PBS washes, embryos were mounted for confocal imaging. Abbreviation: e, eye; hy, hypothalamus; m, midbrain; sc, spinal cord. Scale bars: 100 μm (A-C) 50 μm (D-G). Immunocytochemistry/ Immunofluorescence - Anti-GFP antibody (ab6673)Borkowska et al PLoS One. 2016 May 31;11(5):e0156082. doi: 10.1371/journal.pone.0156082. eCollection 2016. Fig 5. In utero electroporation of Disc1 and Disc1-100P constructs into wild-type neocortex and analysis at P21. (Panels D-E”) Expression of the constructs was assessed. (Panels D-D'') 2 days after transfection in vitro. (Panels E-E'') at P21 in vivo. Immunohistochemistry (Frozen sections) - Anti-GFP antibody (ab6673)Goldman et al PLoS One. 2018 Jan 12;13(1):e0191245. doi: 10.1371/journal.pone.0191245. eCollection 2018. Fig 5. 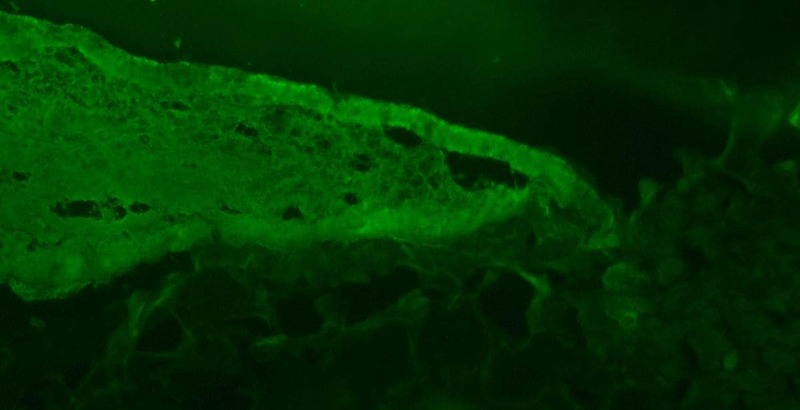 Immunofluorescence for assessment of GFP+ myofibers in rat tissue. VML affected muscle from the 50% MG + HA+LMN group were probed for the presence of GFP. 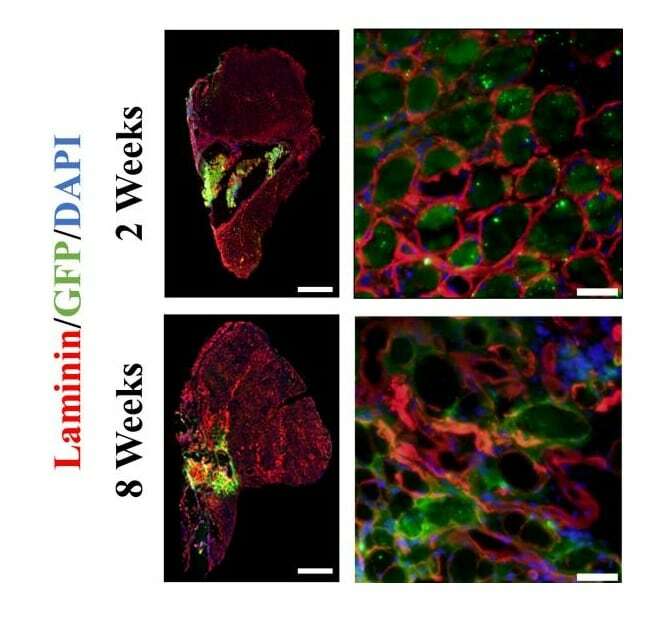 GFP+ fibers were detected in a qualitatively similar magnitude at both 2 and 8 weeks post-injury indicating viable engraftment of donor derived muscle progenitor cells. Scale bars are 1mm for whole mount images, 50 μm for regions of interest. A portion of the TA muscle from the defect region was embedded in a talcum-based gel, frozen in 2-methylbutane, and supercooled in liquid nitrogen. 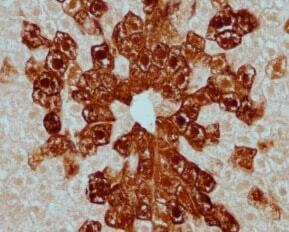 Cryosections (8 μm) were prepared and stained using standard protocols for hematoxylin & eosin. ab6673 used at a 1/100 dilution. Immunohistochemistry (Formalin/PFA-fixed paraffin-embedded sections) - Anti-GFP antibody (ab6673)Cedeno et al PLoS One. 2017 Sep 21;12(9):e0185196. doi: 10.1371/journal.pone.0185196. eCollection 2017. Fig 3. Mouse small intestines were washed with DPBS and fixed overnight at 4°C in Zinc formalin. Following sectioning and tissue deparaffanization, antigen retrieval was performed with 10mM Tris base (pH 9.0) buffer using a pressure cooker. For immunohistochemistry, sections were quenched of endogenous peroxidases by 3% H2O2, and sequentially blocked with Avidin D, biotin, and protein blocking reagents. Primary antibody incubation was conducted at 4°C overnight. Secondary biotinylated antibody was added at a dilution of 1/200, and incubated 2 hours at room temperature. Finally, sections were stained according to the ABC peroxidase protocol and counterstained with hematoxylin. ab6673 used at a 1/200 dilution. Panel D: Representative anti-eGFP immunofluorescence of macroH2A WT and DKO jejunum counterstained with DAPI (blue). Blocking Buffer: 1% Casein-TTBS for 30 min at RT. E5.5 Hex-GFP transgenic mouse embryo stained for GFP using ab6673 at 1/500 dilution. Secondary antibody is a fluorochrome conjugated anti-goat IgG secondary antibody at 1/10,000 for 45 min at RT. Staining: GFP as green fluorescent signal with DAPI blue counterstain. Additional bands at: 33 kDa. We are unsure as to the identity of these extra bands. Western blot - Anti-GFP antibody (ab6673)This image is courtesy of an anonymous abreview. 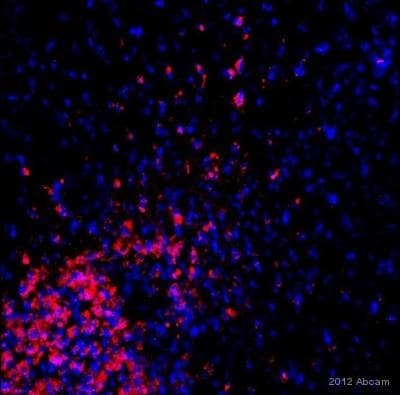 Immunofluorescence of TGN mouse liver labeling GFP on hepatocytes with ab6673. Immunohistochemistry of GFP transgenic mouse liver labeling GFP with ab6673. Does this antibody cross-react with other GFP variants? 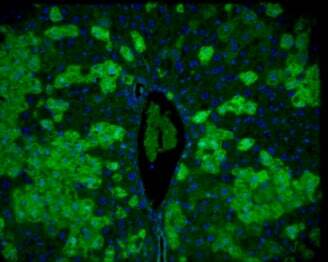 This anti GFP antibody has reacted with all tested variants of GFP from A. Victoria tested including YFP. We have not tested with eYFP specifically. The lots we have tested have not shown cross reactivity to RFP. Quisiera hacer una inmunofluorescencia anti-GFP. Cuento con el anticuerpo Anti-GFP antibody (ab6673) y quisiera preguntar cual es la vida media del producto almacenado a -20 ºC. Además quisiera pedirles que me recomendasen un anticuerpo secundario contra este anticuerpo para hacer una inmunofluorescencia en color verde. El anticuerpo ab6673 se ha testada en inmunofluorescencia con tejidos, bien sea congelados, o embebidos en parafina. No tenemos constancia de su uso en células, por lo que si esta es la aplicación que queréis llevar a cabo, te animaría a que me lo comentaras, y quizás podamos encontrar otra alternativa que ya haya sido testada, y que por tanto esté garantizada. En general recomendamos conservar los anticuerpos a 4C si se consumen en la semana o dos semanas siguientes a su recibimiento, aunque en principio a 4C son estables hasta un año. A -20C se estima que se mantengan estables hasta 5 años. En cualquier caso se aconseja alicuotarlo en cuanto llegue y evitar ciclos de congelación / descongelación. De cualquier manera, os animamos a usar el anticuerpo en los 6 meses siguientes a la fecha de compra, para en caso de tener cualquier problema con él, que éste siga estando bajo nuestra garantía https://www.abcam.com/index.html?pageconfig=resource&rid=10372πd=10000&source=pagetrap&viapagetrap=abpromise. Respecto al secundario conjugado en verde, hay muchas alternativas disponibles en el catálogo. Puedes consultar las alternativas conjugadas en https://www.abcam.com/index.html?t=6013&pt=7&c=3050&ei=μ=pt, https://www.abcam.com/index.html?t=6013&pt=7&c=5034&ei=μ=pt o https://www.abcam.com/index.html?t=6013&pt=7&c=1874&ei=μ=pt. Si quisieras más información sobre alguna de ellas, no dudes en hacérmelo saber.